The gathering was great success. Now we fixed the admission fee : 5,000 Yen. In short, PUXPO2000 is a national PalmOS user get-together. This is the third time that Palm lovers from all over Japan will come together, the first being "PUXPO'99" in September 1999, and the second "Makuhari2000" in February 2000. PUXPO2000 is organized and executed by the user community itself, rather than being a corporate event, which makes the event a special occasion for Palm users nationwide. And of course, PUXPO2000 is an open event, and welcomes to-be-users who are still deciding whether or not to buy a Palm. Updates will be announced here as they are confirmed. The PUXPO2000 Organizing Committee is a completely non-paid, non-profit organization. The Committee's thanks go out to the manufacturers and shops for their support in making PUXPO possible again this year. 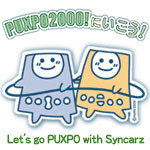 Please write the PUXPO2000 Organizing Committee at the following address if you have any questions or comments concerning PUXPO2000 or this site. days to go before the PUXPO2000!